Bobson relaunched its successful R.E.D. (Revolutionized Enhanced Denim) Campaign, a more Edgy, Progressive and Modern silhouette, fit and styles. The result is SERIES II, a highly anticipated response to loyal customers demand for quality and fashionable denim line for ladies and men. 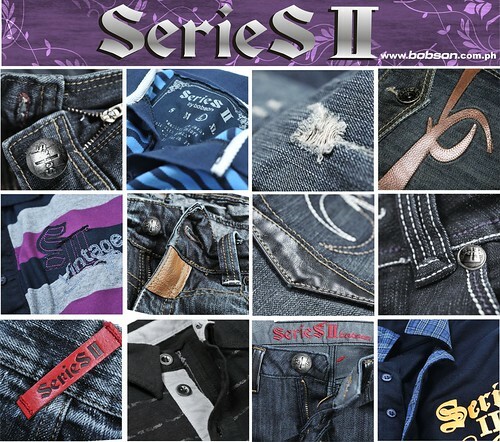 Fashionistas and Fashionistos can now enjoy choices of new colors and washes, unique pocket details, appliques, embroideries in Bobson's Series II denim and tops at a reasonable price. Truly up-to-date, hip and fits your budget. Each denim pants has a slanted red leather belt loop at the back. The Series II pants were designed with larger back pockets, wider waistband, and red facing combination. For men, you can expect the classic regular straight fit. But now they offer slim fit, for the more daring and fashion forward men of today. that sits low on the waist, tight through the thigh and tapers all the way down the bottom. Bobson also designed their Series II shirts and tops with today's men and women in mind, hip and appealing. Bobson Series II is available at all SM, Robinsons and leading department stores nationwide.